Something old comes to mind when one thinks of vintage. Perhaps a touch of nostalgia. 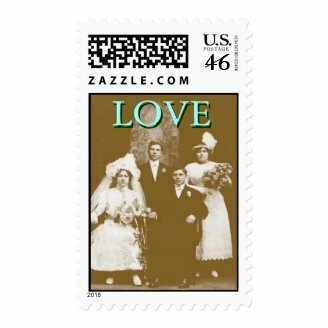 That is the look on these wedding stamps, designed especially for invitations with history. 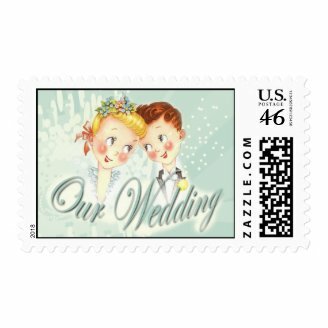 Whether you're an older couple looking to reminisce, or a young couple that is old fashioned at heart, you're apt to find some wedding stamps that will suit your invitations just fine, here. 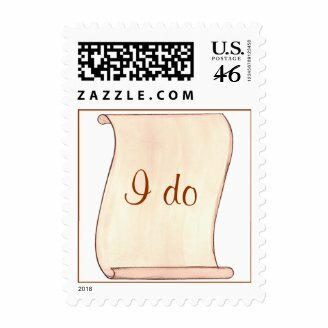 I have hand picked these stamps from Zazzle, a quality print on demand company, that will print them up when you place your order. 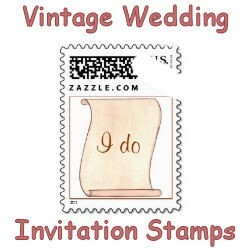 The stamps from Zazzle are easy to apply. They are peel and stick, and come in different denominaitons and sizes. 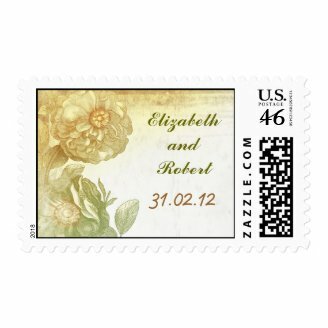 You can order first class postage, and you can also order the design on postage stamps. Orientation styles include square, and horizontal - both in portrait and landscape style. The wedding couple of the groom carrying the bride seemed to be quite popular. They do remind me of a young couple at an earlier time. I saw this design with various background colors, this one can be customized if you like. To pick a different background color below, click on the stamp, then on Customize It, then on Edit, then on Background, then on the Color of your choice, and then on Done. Many wedding dresses were very lacy and also more cream and antique looking in color. 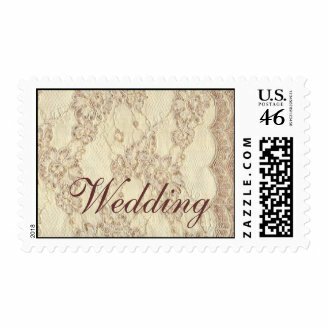 The aged ivory and brown colors gives this lace design a more vintage look. The pattern also has an older style to it. This definitely looks like an old photo. Many of the early photos were taken with people standing very still. They perhaps had to wait for the camera to be ready, and had to hold their pose for a bit. I think that's why a lot of people in early photos didn't seem to show much expression. I used to think that the older people were just so serious. Then I saw a special about photography. A lot of times the photographer was also suppose to be in the picture. He had to get it ready to take a picture, and then quickly run over and join the group. Click and "Say cheese," didn't come until later. Early artwork gave lots of people rosy cheeks. Have you ever eaten in a Cracker Barrel and/or other restaurants with old artwork and labels adorning the walls. Most of them have very light colors, but the cheeks were always rosy, no matter the age of the people. Sometimes vintage is all about the car. Vintage cars have become great collector items. I must say that the older cars can be very stylish indeed, and many look very romantic. Cars then were made to be not only be basically functional, but also with more flare. The people of the day weren't so concerned with aerodynamics then. The white car here with a red rose, definitely make this a fun choice for vintage car buffs that are getting married. Another example of early artwork shows a faded flower. The colors were more subdued and not so clear or vibrant. The colors that were used gave the flowers a soft, yet aged look. The couple's names and wedding date can easily be customized on the template form. Just click on the item and look to the right. Much of the early writings were written on parchment paper, and or scrolls. Scrolls were used for important announcements. Before scrolls were made on parchment paper, important messages were written on sheets of copper and tin. Please share with those who will benefit. Hope you enjoyed some nostalgia while you were here. Which is your favorite design? RSVP - stands for the French phrase "Répondez s'il vous plaît" which translates to "Respond if you please." An RSVP stamp on the envelope alerts invited guests to respond. Weddings are a statement of love and also creativity. 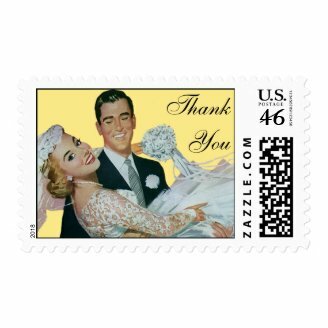 Brides and grooms get to let their personalities come out in their choice of venue, wedding invitations, postage stamps, etc.